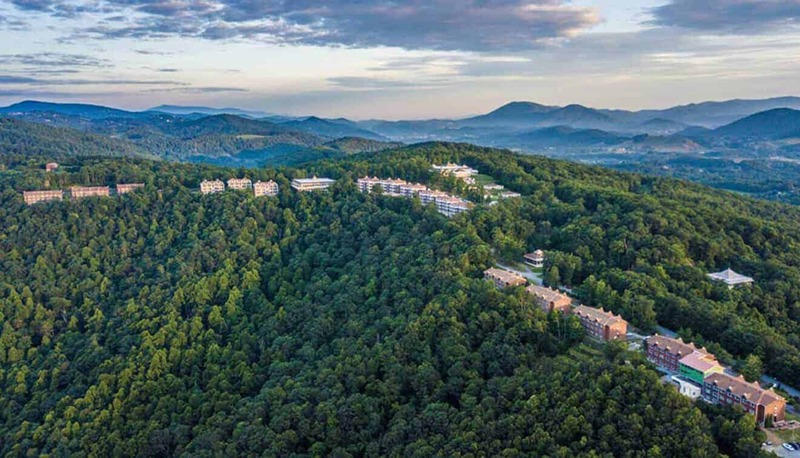 Last summer, a friend of mine, Sejal, suggested I take a three-week course in the mountains of Boone, North Carolina to become a yoga instructor. At first, of course, I said no. I’m in my 50’s and not very bendy. Except for taking Sejal’s yoga class at the Art of Living Retreat Center, the only yoga I had taken was a class here and there at the YMCA and a few other fitness centers. Those classes were more feats of calisthenics than true yoga, and left me sore and feeling inadequate. Sejal persisted, which made me wonder, “Why?” Why should a woman in her fifties with minimal experience in yoga become a yoga teacher? “You don’t have to be bendy,” Sejal insisted. She went on to say that this is about a lifestyle, a chance to make life better. Suddenly, and surprisingly to me, my “Why should I?” turned into “Why not?,” and I headed to the mountains of Boone with my car packed full of clothes and emergency cookies. Upon reaching the Art of Living Retreat Center, I immediately felt a sense of calm, as though I was home. I checked into my dormitory-styled room, heaving my overstuffed luggage up the stairs. My room consisted of a bed, a nightstand, a desk, and a chair. I opened the windows and let the fresh mountain air fill the room before walking to class. The view from the front of the building was gorgeous as I stopped by the benches placed for people to sit and breathe in the mountain view. It was October 14th, and the leaves were changing color. I walked up the hill to one of the buildings below the main ashram. The crisp air, the view of the rolling mountains, and the overall stillness of retreat center made life feel simpler as I walked towards Veda II, the building I would be taking classes in for the next three weeks. While sitting on our yoga mats, the class had a short introductory session before we broke for dinner. It’s a steep hill up to the dining hall, one we would walk up and down many times over the three-week course. The dining hall for the Art of Living Retreat Center is entirely vegan, and meals are served buffet-style. There were so many choices of food that I found my plate piled high each meal because I wanted to try everything. Chef Mel was fabulous at providing unique meals and only repeating dishes when asked – his tomato and pepper bisque was a welcome repeat. Windows lined the dining hall wall and displayed a view of the rolling mountains painted with the changing fall leaves. That first night, I sat and ate dinner amongst strangers not fully aware that after three weeks these people would become my family. The first full day set the tone for how physically and mentally demanding the course would be. I set out for the day at 5:05 am, meeting Sunita and Daisy (another classmate) for the 15-minute walk up the hill to class. At 5:05 am, the stars shone very brightly in the night sky. The brisk morning air stung my cheeks. I planned on bringing with me to Boone a mini Keurig so I could continue having my morning coffee, but my teenage daughter would not allow me to bring one. “Mom,” she said with great exasperation, “It’s like bringing beer to rehab. You are not bringing a coffee machine to learn yoga.” She was right, and the coffee-free brisk morning walk helped to wake me up for the 5:30 am class. The early morning class began with yoga, breathing exercises including Sudarshan Kriya (rhythmic breathing developed by Sri Sri Ravi Shankar), and Sahaj Samadhi meditation until 8:30 am. Then it was time for breakfast. One of the essential aspects of Sri Sri Yoga is seva (selfless service). We were all assigned a seva, and my seva was working in the kitchen after each meal. Usually, I would not be excited about working in a kitchen. Truth-be-known, I am never enthusiastic about working in my kitchen at home. It made a huge difference that this kitchen was not my kitchen. It was a commercial kitchen filled with happy people whose intent was to help others. I would dry dishes and put them out on the counter, or stack dirty dishes bound for the large industrial dishwasher. This dishwasher had a conveyor belt system. Every time I pushed a tray into the machine, it reminded me of how people get on rides at Disney. I scrubbed pots and pans, and I wrapped fruit. Whichever task I did, I did with contentment. It’s amazing how being around like-minded happy people can make even the most menial tasks enjoyable. Jim managed the kitchen. This job was his retirement job, and he always had a pep in his step and a sparkle in his eyes. Other classmates worked in the kitchen with me. We would talk about our families and lives back home as we dried dishes, or whatever chore we were doing. Seva was a very grounding and comforting experience. After breakfast, it was back to Veda for more yoga. The Yogi Master, Krishan Verma, would have us hold specific yoga poses or asanas, and I would think, “Wow, I am awful at this,” or “I’m not going to be able to stand up and walk again after holding this pose for so long.” After a session, I would stand up and walk just fine without any pain. Yes, I would be exhausted, but I would not feel pain, which amazed me. There were many times that first week when I kept looking into Krishan and his wife Bharti’s eyes thinking they were going to shake their heads at me with an awkward look of annoyance and point towards the door saying, “This really isn’t working. It’s time for you to leave.” Of course, that never happened – it was just doubt overwhelming my mind. I doubted whether I would be able to do all the poses. My body is still recovering from a car accident I was in two years ago. It was a significant accident. I had neck problems and mild traumatic brain injury from the wreck that affected my speech and short-term memory. I would think about that as I was sitting crossed legged listening to Krishan teach the class. Maybe Sejal was wrong? Maybe I wouldn’t be able to do this. I kept doing all the poses to the best of my ability, taking the meditations seriously, committing to the breathing exercises, arriving to class early, and listening to what the teachers were instructing. At some point during the first week the doubt I was carrying became unimportant. It was still there. At times, it would wash over me in waves, but I found it best to acknowledge it and move on. Maybe it was the fact that I was constantly busy? Perhaps the yoga poses, breathing exercises and meditations were giving me the strength I needed to ignore the persistent nagging doubt? Maybe I was just too exhausted? I don’t know, but I stopped listening to that voice in my head that said, “You can’t do this because of…” I began to concentrate on one step at a time. We would break for lunch between 1 and 1:30, walk up the steep hill, eat lunch, and I would work in the kitchen again. That first week, as I got to know my classmates better, I began to notice that we all had voices of doubt to overcome. Life is difficult for everyone. It doesn’t matter what kind of doubt someone carries. Doubt is doubt, and for every individual, it can stop progress. Some days, my classmates and I would talk a lot while doing seva. There were days when we wouldn’t talk at all. Then there were days where we would laugh and sing. It all depended on what we were working through that day. Our struggles might have been different, but our paths were similar. By the end of week one, we had learned all the Sri Sri Yoga poses, and we began learning anatomy and ancient yoga knowledge. Class started at 5:30 am and ended at 10 pm, followed by a daily written homework assignment and studying. After week one, the battle between myself and my mind had quieted. Now I wondered, can my body withstand the course?